Summary: Today is looking dry and lovely. Rain returns Friday afternoon and ruins the first part of our weekend. Today is shaping up to be a really nice day ahead of possible severe weather to end the week. Today we are looking at partly sunny skies with a high of 64 degrees. Winds will be out of the north at 5 to 10 mph. Thursday night sees partly cloudy skies still with a low of 42 degrees. Winds will still be out of the north but at only 5 mph. Friday and Saturday: rain chances increase and possibility for severe weather. Friday our lovely wet weather returns in the afternoon with a 30% chance of rain. Our high will be 65 degrees as rain chances increase after 1pm with winds coming from the east at about 5 mph. Any rain will likely be hit or miss showers or storms. Friday night rain chances dramatically increase to 70% chance of rain as our low dips to 59 degrees and the winds change and come out of the southeast at 5 to 10 mph. These will be more scattered showers and storms. Can’t rule out one or two possibly being strong. The SPC has us outlooked for Friday 7am through Saturday 7am in the MARGINAL category. Saturday is the day we are watching for a chance of severe weather, as a strong cold front and low pressure system comes trucking through. There’s a 60% chance of rain on Saturday and a 30% chance of rain Saturday night. The SPC has us outlooked for severe weather for Saturday 7am through Sunday 7am in the SLIGHT category. 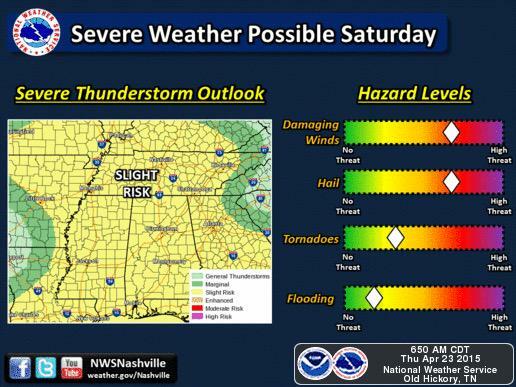 The NWSNashville has also put this graphic out as well ahead of Saturday’s potential severe weather. Rain will likely greet us Saturday as we wake up and start our day, with some clearing in the afternoon (allowing for daytime heating), then more storms are expected to develop in the afternoon. It’s the afternoon storms that have us concerned. So far this event on Saturday is shaping up to be one that we all need to pay attention to, as all the ingredients appear to be there for potential severe weather. We’ve had it relatively easy the last few systems, but this one I’m particularly concerned about given all the things in place: lots of moisture (which increases CAPE – convective available potential energy), wind shear, strong cold front, and it coming in during daylight hours (daytime heating will strengthen these storms). Also, the “t” word has been said already, meaning they anticipate enough shear and instability in the atmosphere that supercells could develop enough to produce a tornado or two. Important note: With anything involving weather and in particular severe weather, things change multiple times a day and will likely change before Friday/Saturday. We are still more than 48 hours away from the event, so things could change before the day of the event. Skipping ahead to Tuesday a bit, as there is another chance of severe weather being looked at as a second system will move in then. I know, we aren’t happy about it either.